So, following on the heels of my Holy Days post, the major project that I’ve been putting together as a sort of finale for my work with the Boar Clan has been a map of sorts. It’s a temporal map, recording all the various ways I keep track of time throughout the Wheel of the Year. The base comes from John Michael Greer’s Druid Magic Handbook, but I’ve made several additions of my own as well. …all these in addition to my own peculiar homegrown aesthetic. So yeah, there can be no doubt this is a syncretist’s drum! Again, the 8 festival gates, the paths between them, and the associated ogham for each path come from the DMH. 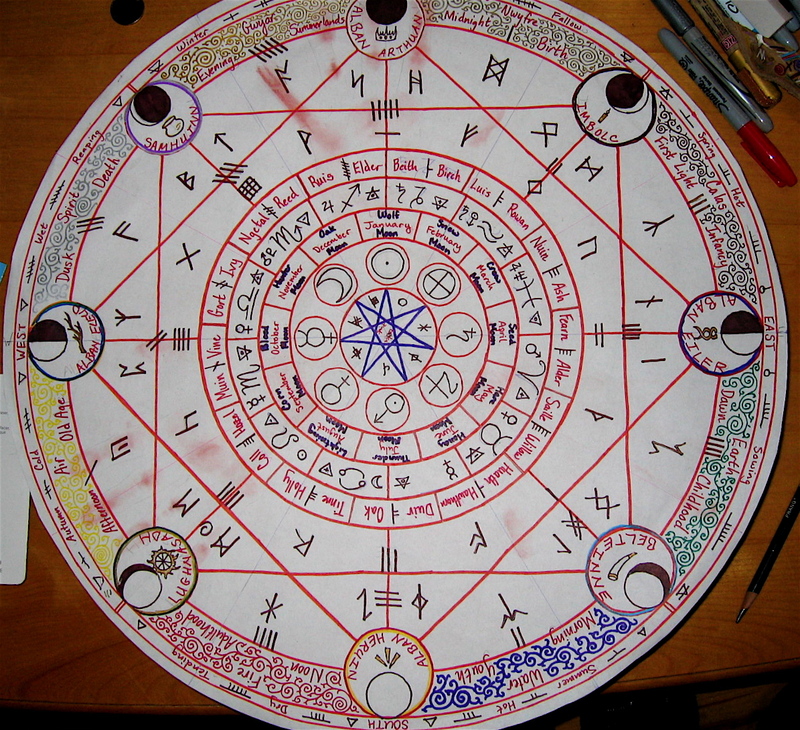 While I was doodling the overall plan, I was squirming that there didn’t seem to be a way to include the runes, which is the divination system I’ve always felt most comfortable with. There wasn’t a nice way to aesthetically place the runes on the paths along with the ogham, and even if I did try that, there would only be room for the Norse futhark, when I like using the whole 33 rune A-S set. And this is where having an art brain can come in handy: I started looking at the negative space. There are, in fact, 32 “empty spaces” defined by the paths of the Wheel of Life. Plus the center grove, this makes 33—the total number of A-S futhorc! The next tricky bit was arranging them. Looking at the pattern, I could discern two interlocking squares of 8 spaces each, one for the solar gates and one for the cross quarters. Then there was an inner “ring” of 8, and and outer “ring” of 8. This happens to match up nicely with the 4 aetts of the futhorc. The outermost ring I gave to Hel’s Aett, starting between Alban Arthan & Samhain, and going counter-clockwise. The catabolic cycle. The innermost ring went to Freya’s Aett, starting on the “sunny side” of Alban Arthan and going clockwise. The anabolic cycle. Haegl’s Aett is sometimes referred to as the external influences, so these were placed clockwise around the solar festivals, again starting on the sunny side of Alban Arthan. Tyr’s Aett or internal influences were placed around the cross quarters going counter clockwise from Samhain. Lastly, Gar, as a kenning for the World Tree, was placed in the central grove as representing the Axis Mundi. Do I think I’ve stumbled across some sort of long lost relationship between runes and ogham? Hell, no. But I do feel as if I’ve been given a gift, a way to acknowledge and celebrate both my Germanic and Celtic heritage though this map. The runes define the space between, leaving the direct flow and relationship of wyrd to be best described by the ogham fews. The rest of the symbolism is much more straightforward, drawn largely from the various correspondence charts presented in the DMH and the OBOD Bardic grade material. The outermost ring consists of the elements and their classical associations and symbols, along with the modern correlating ogham. The next ring depicts the 8 Holy Days, their colors, symbols, and associated moon phases. The lines connecting these stations are marked with their own ogham and the spaces between house the runes. Next come the three “monthly” calendar rings: Graves’ Tree Calendar (yes, I know it’s completely made up—I happen to like it anyway), the Western Zodiac, and a mish-mash of agricultural names for the various moons that suit my bioregion and experience here in New England (drawn from these sites). 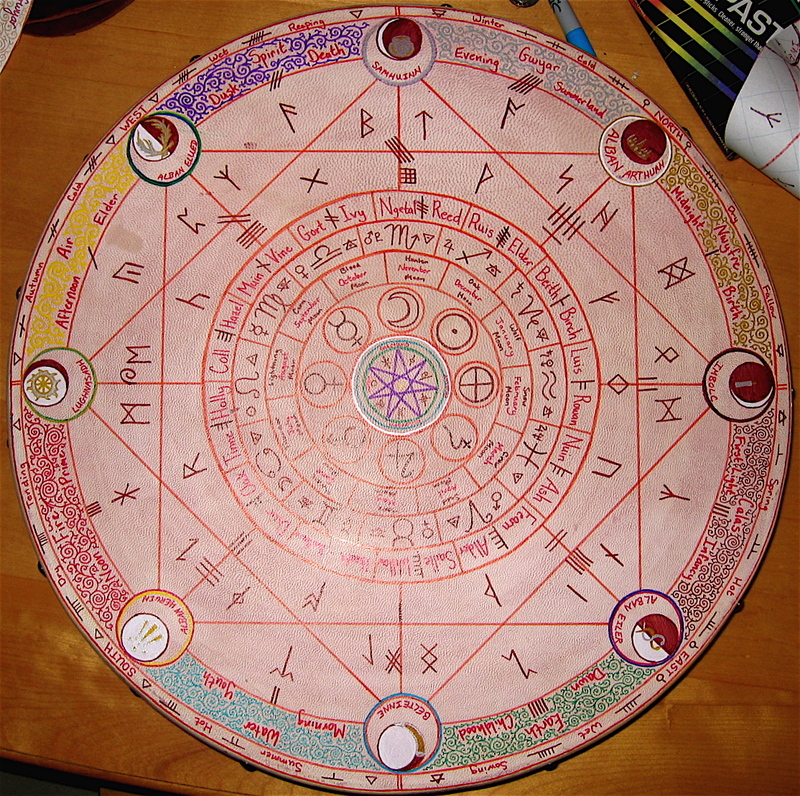 The inner circles consist of the planetary associations with the 8 Holy Days, the 3 Druidic levels of being, and the 7-pointed star which defines the Drudic spacial paradigm (4+2+1). Lastly, the ogham and runes associated with Spirit surround the star, which holds an Awen at its center. 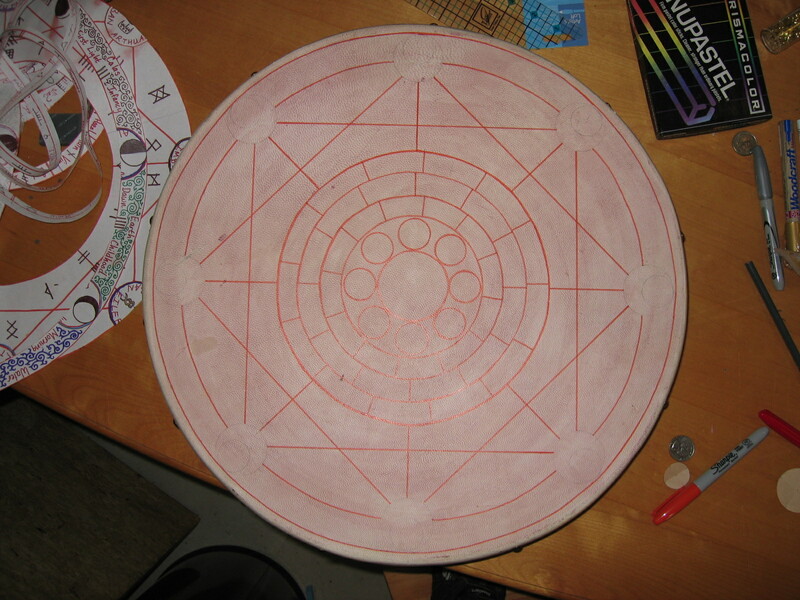 Once I had all of this worked out on a full-sized paper pattern, it was time to transfer it all to the drum. The drum itself has an interesting history. It was given to me by one of the members of my first ADF grove when he moved his family to Oregon to grow pears. He was an interesting fellow, much more of a cultural Druid since he had converted from Paganism to Catholicism after marrying. But he was a wealth of knowledge, always tossing out riddles to the younger grove members: “Why do the dogs have red ears?” and “What can the ancestors use that we cannot?” I was really touched when he passed his drum on to me before he left. There are a number of traditions which “bloody” or “feed” an object in order to make an enchantment stick. For this project, it happened purely by accident when my husband spilled some port wine down the front of the skin. At first I was distraught, but then decided to make the best of it. I gave the surface three coats of port on the Solstice to prepare it for the work ahead. After many Google search and much chewing of nails, I decided to use Sharpie markers for the design—and they’ve turned out to be a leatherworker’s best kept secret. There’s a much better degree of control than with dyes, and a wide color palette. The next trick was transferring the pattern. I ended up destroying the paper template by cutting it apart with an exacto knife. I was too worried about my compas puncturing the drum head trying to recreate the circle by hand, so I decided to use the ones I had already drawn. The tracings did not come out perfectly, but then the drum isn’t perfectly round either, so a little fudge factor actually worked in my favor. From there on out, it was a pretty straight case of filling in the details. The one other exciting part of the project was learning how to draw a nearly perfect septagram (or heptagram if you prefer) with a compas and ruler. It was both fun and challenging, and has reaffirmed my desire to put more effort into learning about sacred geometry—in my copious space time, of course. I put the finishing touches on the design today, filling in the holiday associations with a airy/foliate pattern born from the throes of tedium of high school US history (you really never know when this sort of thing is going to come in handy). Tomorrow, I’ll use the drum to complete my final journey to the Boar Tribe. I don’t know what will happen after that, but I do know that I’ve created something both necessary and beautiful. And I’m content with that. Also, you gotta love those happy accidents. I think the port wine accident was just what the drum wanted and needed, it gives it a really nice colour. I think you’re right about the wine, too. The port ended up making the colors that much more intense because the whites and yellows are now brighter in contrast to the background. The drum definitely wanted to be fed, though—the wine was spilled a good 10 ft. away, and three drop managed to travel all the way across the room and land on the drum head! Absolutely stunning and well-thought out and researched design pattern too. 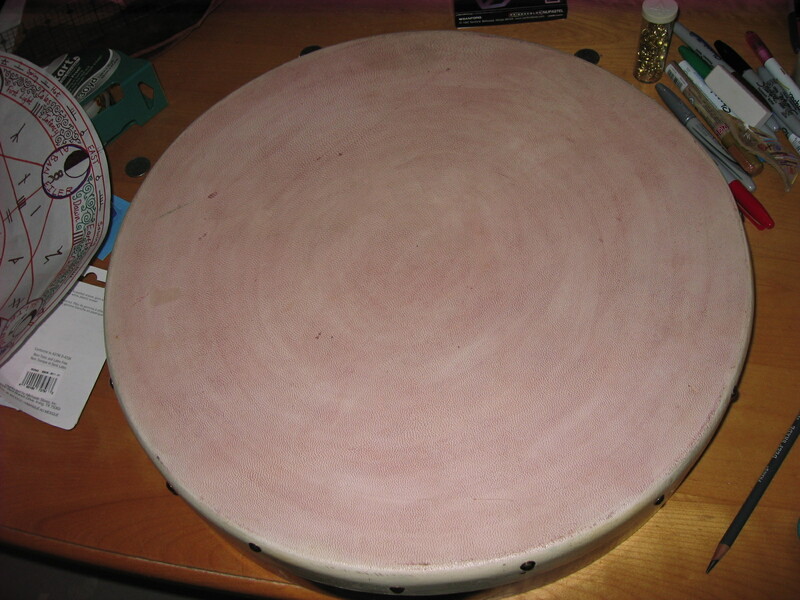 The drum will have such a powerful effect for you rnow being imbued with so much creative effort and thought. I found this to be true when dowsing or feeling for power places. Invariably the strongest human power is in objects that have been given such attention. Could you do a recording of how it sounds in a sacred space, like a cave, maybe? That would be wonderful to hear and share that sound! All power to your elbow (and hands), as they say! Thanks, Gwas! You’re certainly correct about the power increase. The last time I used it for journeying it was almost effortless to slip into the Otherworlds.